The recent announcement that Russian Prime Minister Dmitry Medvedev signed a decree on June 21 approving the a draft convention on the legal status of the Caspian Sea appears to generate new possibilities for Central Asian energy producers. The lack, to date, of an agreed legal status for the Caspian prevented the realization of the long-awaited Trans-Caspian oil and gas corridor, which will allow Kazakhstan and Turkmenistan to deliver energy exports along an alternative westward corridor, achieving a strategy of export diversification. This coming August in the Kazakh city of Aktau, the five Caspian littoral countries (Azerbaijan, Iran, Kazakhstan, Russia, and Turkmenistan) are expected to sign the agreement, which could potentially solve a regional issue that has been hotly debated since the implosion of the Soviet Union in 1991. In the post-Soviet period, the countries on the Caspian Sea have aimed to exploit the huge untapped oil and natural gas reserves of the basin — 48 billion barrels of proven oil reserves, while natural gas reserves are estimated at 8.76 trillion cubic meters — undertaking the diversification of export energy routes as a strategy to strengthen their political sovereignty and economic independence. The promotion of a westward energy route — allowing the transport of Caspian oil and gas to the EU market, bypassing Russian and Iranian territory — has always represented an ambitious diversification project, even if only Azerbaijan can easily undertake this option, thanks its geographic position. Unlike Turkmenistan and Kazakhstan, Azerbaijani energy exports don’t have to cross the Caspian Sea in order to reach Western markets. However, the unsolved disputes on the ownership of some offshore oil and gas fields located on the southern shore of the Caspian basin (mainly involving Turkmenistan and Azerbaijan) and the lack of agreement among the five littoral states on the Caspian’s legal status have hampered the realization of a Trans-Caspian oil and gas corridor. One facet of the overall Caspian debate is the determination of whether the basin is a sea or a lake: if the Caspian basin is considered a lake, the littoral states can equally divide and exploit the energy potential of the basin (this option is backed by Iran, which holds only 13 percent of Caspian reserves), while if the Caspian is designated as a sea the states can fully exploit the energy reserves contained only within their maritime borders. Russia and Iran have always boycotted the realization of underwater pipelines along the Caspian Sea, citing environmental issues and arguing that the construction of some offshore infrastructure needs the consensus of all five countries. However, Russia’s opposition is mainly motivated by geopolitical reasons: Moscow fears losing its lucrative business and influence represented by EU dependence on Russian gas imports. According to Article 14 of the draft convention, this problem appears to have been solved: the draft states that the littoral states could realize underwater pipelines with the approval only of the countries through whose sectors of the sea the pipeline would pass. This is the position that Azerbaijan and Turkmenistan have commonly supported since 2010. Apparently they have overcome the traditional opposition of Russia and Iran. Among post-Soviet Caspian states, Kazakhstan holds the largest offshore oil and gas reserves. 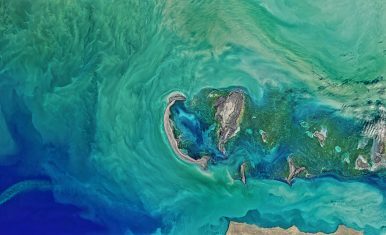 The Kazakh section of the Caspian Sea contains most of the basin’s largest known oil fields, such as Tengiz — which alone produced 570,000 barrels of oil per day (bpd) in 2017 — and Kashagan (with 13 billion barrels of estimated oil reserves). Considering that oil and gas export routes from Kazakhstan are exclusively directed to Russia and China, Astana urgently needs to realize a westward export route, developing enhanced energy cooperation with Azerbaijan as a key transit country to coherently implement a diversification strategy. Since 2006 the Baku-Tbilisi-Ceyhan (BTC) pipeline has represented a concrete option to diversify Kazakhstan’s oil exports through a westward route. In spite of Kazakhstan’s original commitment to ship 500,000 bpd with tankers across the Caspian Sea from the Kazakh port of Aktau to the Azerbaijani port of Baku, Kazakhstan was not able to reach this target. Oil exports through the BTC pipeline were suspended from the second half of 2015 to 2017, when Astana decided to restore them. These countries have organized several intergovernmental meetings to discuss energy cooperation and they agreed on the creation of a working group to evaluate the feasibility of an underwater oil pipeline as well as the viability of LNG facility in western Kazakhstan. The idea to deliver Kazakh oil exports through a Trans-Caspian underwater pipeline (with a nominal capacity of 150,000 bpd) appears the best option not only to make use of rising production out of Kashagan but also to achieve the diversification of energy export routes. After a decade, Kazakhstan and Azerbaijan are working to revitalize the Trans-Caspian Oil Transport System (TCOTS). This project, originally supported by the EU, is composed of an overland pipeline from Eskene to Kuryk in Kazakhstan (named the Kazakhstan-Caspian Transportation System, KCTS), and an underwater pipeline from Kuryk, near Aktau port, to Baku. Azerbaijan is also a key partner in developing bilateral cooperation in the gas sector, in order to find new outlets for the growing gas production from Kashagan and Karachaganak fields. Turkmenistan holds the fourth-largest natural gas reserves in the world (19.5 trillion cubic meters, tcm) but the bulk of its gas reserves are located onshore, in the southeastern part of the country. Only 12 percent of its gas production comes from the Caspian area. In spite of this energy bonanza, this landlocked country has few options to diversify its hydrocarbon exports. Among the existent export pipelines, only the Central Asia-China pipeline is currently operating while pipelines to Russia and Iran are not in use due to a combination of economic and geopolitical reasons. Consequently, at present China is the only significant buyer of Turkmen gas (31.7 bcm of natural gas were shipped to China in 2017), highlighting a condition of extreme vulnerability in Turkmenistan’s energy security due to the dependence on a single export route. In 10 years Turkmenistan basically shifted from a dependence on gas exports to Russia to a dependence on exports to China. Ashgabat’s gas production is expected to reach 230-50 bcm/y by 2030, and the country urgently needs to find alternative markets to export to. However, Turkmenistan’s efforts to implement a diversification strategy have been regularly hampered by geopolitical and security issues. The TAPI gas pipeline project — including Turkmenistan, Afghanistan, Pakistan, and India — is conceived as an alternative eastern corridor of exports, but Afghanistan instability severely weakens the possibility of realizing this energy route in the near future. Following the completion of the domestic East-West pipeline in December 2015 Turkmenistan can deliver 30 bcm/y of natural gas from the Galkynysh field to the Caspian coast, waiting for the realization of the so-called “missing link” represented by the Trans-Caspian pipeline. During the last decade Russian opposition to the TCP’s realization has prevented full Turkmen engagement in the Southern Gas Corridor project. In addition to geopolitical issues, Turkmenistan’s involvement in the Trans-Caspian pipeline will also ensure higher economic revenues compared to exports toward China. In order to repay the multi-billion dollar loans granted to develop the energy sector, China is believed to be paying lower prices to buy Turkmen gas imports, depriving the national budget of huge revenues. The positive energy that emerged after the Caspian foreign ministers’ meeting in December 2017 has given rise to new expectations on the realization of the Trans-Caspian pipeline. Undoubtedly, wider cooperation with Azerbaijan represents a key precondition to achieve and is aimed at solving existent disputes on the ownership of the Kyapaz/Serdar offshore gas field. Political delegations of both countries have been engaged in discussions to enhance the energy cooperation and to further involve Turkmenistan in shipping natural gas to the EU. At present, cooperation with Azerbaijan is the only way for Ashgabat to implement a westward export route. Worsened relations between Iran and Turkmenistan pushed Teheran to refuse Ashgabat’s proposal about a gas-swap deal with Iran in order to get Turkmen gas to Turkey through an overland route which would be linked to the Trans-Anatolian Gas pipeline and the SGC, thus avoiding the transit along the Caspian Sea. Waiting for the Caspian meeting in August, there are positive developments about the legal status of the Caspian Sea which have been sparking expectations on the realization of subsea oil and gas pipelines crossing the Caspian. However, the settling of other relevant issues (i.e the delimitation of the seabed in the southern Caspian among Turkmenistan, Azerbaijan, and Iran) appears to be postponed, potentially further freezing regional energy cooperation. A shared agreement on the Caspian has been a long-term goal and one that holds deep importance for the littoral states. The involvement of Turkmenistan and Kazakhstan in the Southern Gas Corridor could subsequently have serious geopolitical and strategic impacts on Russia-EU energy relations.